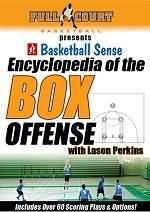 This article is the first in a series of four articles on basketball's Box-set offense and coach Lason Perkins' excellent DVD on the Box offense. Coach Perkins at this writing resides in Cary, NC and coaches basketball at Cary Academy. Lason Perkins is recognized globally as one of basketball's brightest coaching minds. He has coached at every level of basketball from elementary school to the professional ranks, and is the creator of many instructional basketball videos. He is a great student of the game with an expert understanding of Xs and Os, and maintains contact with coaches from around the world. Coach Perkins has researched the Box offense in great detail and presents 34 detailed plays and options, all with on-court demonstrations. Plays are categorized as (1) baseline plays for your shooters (7 plays), (2) post plays (15 plays), (3) pick and roll plays (6 plays), and (4) isolation/backdoor plays (6 plays). Get the DVD and all 34 plays! The Box set has been around for a long time and has been used at every level - professional and collegiate levels, as well as at the high school, middle school and youth levels. 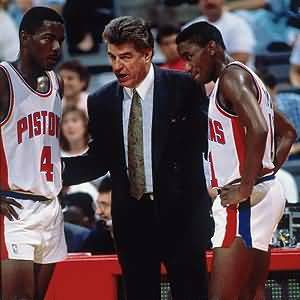 The following coaches have used the box-set at one time or another: Dean Smith and Roy Williams (North Carolina), Mike Krzyzewski (Duke), Tom Izzo (Michigan State), John Calipari (Kentucky), Thad Matta (Ohio State), Chuck Daly (Detroit Pistons), and others. The Box-set is very adaptable to almost any offense. 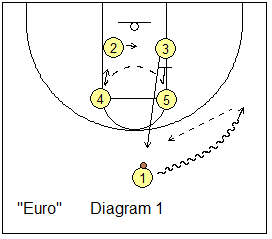 It starts with the two wing (perimeter) players O2 and O3 starting on the low blocks, and the post players O4 and O5 starting at the elbows, with O1 on the top. 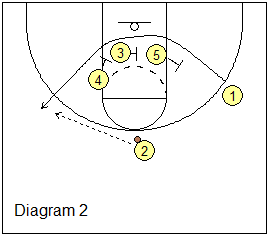 From this box-set you can run numerous set plays, or easily flow into the horns set, or the 1-4 high, 1-2-2, or 3-out 2-in sets. Diagram 1 shows the basic box set that is common to all of these plays. 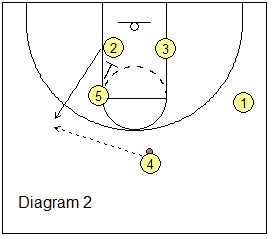 This play will get either O3 an inside shot, or your best shooter O2 an open 3-point shot. Diagram 1 shows O1 dribbling to the right wing. O4 and O5 set a double-screen for both O3 and O2. Diagram 2 shows the circle action as O3 cuts first and curls around O4 and O5. O2 follows O3 but instead cuts to the top (diagram 3). O1 could pass to either cutter. 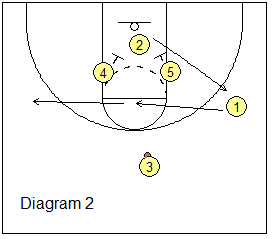 This play is designed to get your best shooter O2 an open 3-point shot on the wing. O1 dribbles to the right wing. O4 and O5 down-screen for O3 and O2. O3 cuts out to the left wing, while O2 cuts to the top and gets the pass from O1. O1 clears to the left corner (diagram 2). O2 passes to O3. O5 sets a flare screen for O2. 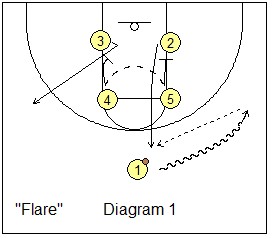 O2 cuts over the flare screen to the right wing and gets the over the top pass from O3 (diagram 3). O2 may have an open 3-point shot here. 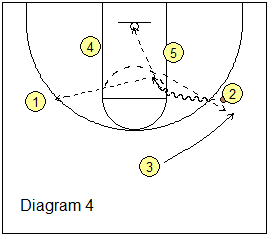 After screening for O2, O5 cuts to the block and could get a pass from O2 for a post up move. After running this successfully, the next time the defenders will "cheat" over the flare screen. So we have O5 slip the screen for a quick pass from O3. This play gets an open shot for your point guard O1. Diagram 1 shows the now familiar start - O1 dribbles right and O5 down-screens for O2, and O2 cuts to the top for the pass from O1. O5, O3 and O4 set a triple staggered screen for O1 (diagram 2). O1 cuts around the screens to the left wing for the pass from O2, and the shot. 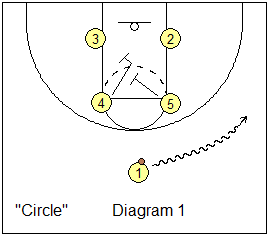 Coach Chuck Daly used this play with his NBA-Champion Detroit Pistons teams. 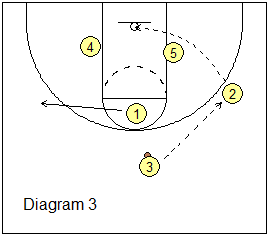 O4 steps out and screens for O1 (diagram 1), and O1 dribbles over the screen to the right wing. Meanwhile, O2 cross-screens for O3, and O1 could pass to O3. Otherwise, O1 will pass back to O4. 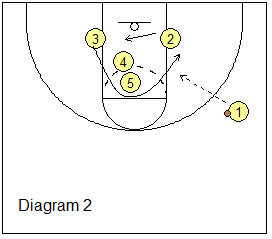 O5 down-screens for O2 (diagram 2) and O2 cuts to the wing for the pass from O4, and the open shot. 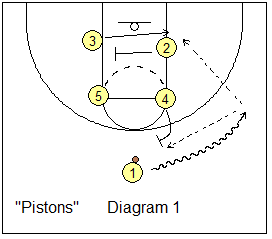 This play has been used a lot in Europe, and the Pistons also used this play to get Rip Hamilton open. 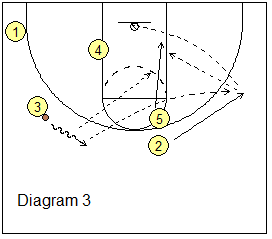 O1 dribbles to the right wing (diagram 1), as O5 down-screens for O3, and O3 cuts to the top for the pass from O1. O1 cuts to the free throw line - at the nail. O2 slides to the middle of the low paint area and O4 slides down. O4 and O5 screen for O2. O2 could cut either left or right. Here we show O2 cutting to the right wing for the pass from O3, and a possible shot (diagram 3). O1 moves to the opposite wing. 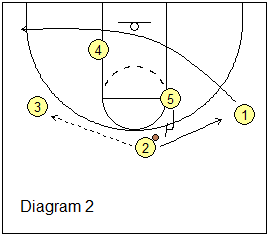 O2 might shot-fake and dribble-drive to the elbow for the jump shot, or floater in the lane. Their are passing, kick-out options (diagram 4), to O1 and O3 (who cuts behind O2). 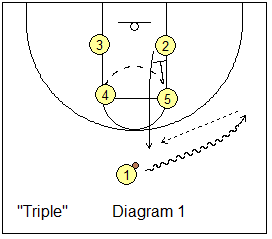 Get more Box-Set Plays in the Premium Members section and the Playbook download. It also includes "America's Play" and "Stagger".